Closets are one of the hardest working storage areas in the home. Often, no matter how much you declutter, it can feel like there just isn’t enough space to store everything. Here are five simple ways to maximize the storage space in your closet. 1) Find the white space. Before you organize your closet, snap a picture. Then, look for any available white space in your closet. (It’s easier to see that white space, or little pockets of empty areas in your closet, when looking at a picture.) Once you’ve identified the white space in your closet, look for ways to fill this space with simple storage solutions. 2) Add a shelf. Is there open white space between the ceiling and the top shelf in your closet? If so, consider installing a shelf in that area. Then, use it to store out of season or special occasion items you don’t use very often. 3) Add drawers. If you have open space below your hanging items, consider adding a drawer unit to hold shoes, scarves, belts or other accessories. 4) Use hooks. Blank wall space can be put to use with hooks for jewelry, scarves, or already worn clothing. 5) Use the door. If you have a walk-in closet, the back of the door is a terrific place to add additional storage. Canvas over-the-door shoe organizers can be used for shoes as well as other small items like mittens, gloves, hats, or other small accessories. These ideas are relatively inexpensive to implement and can greatly improve the function of your closet, making it easier and faster to get dressed and out the door. 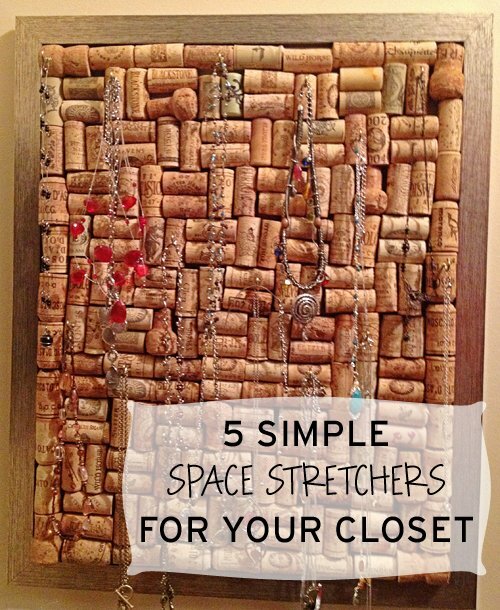 Do you have other ways of stretching the storage space in your closet? Please share your thoughts below. I use a cloth shoe organizer type set up on the inside of my closet door – for underwear, bras, leggings and tights. It makes it easy for me to grab the right color bra or my most favorite undies; best of all, it’s easy to place my clean laundry where it belongs right away– dreading the chore no more! This sounds like a terrific solution Giuli! I only have 4 feet of closet space which is plenty for me. My shoes/slippers are in 2 baskets on the floor. My undergarments are in hanging shelf unit. Best way to keep the closet organized is not to have too many clothes…after all you can only wear one outfit at a time. My out of season clothes are stored in 2 totes, it’s so easy to change over the closet this way. Those are stowed away on the bottom of the closet below my blouses and shirts. Jewerly/scrafs/belts hang up on the inside of the door on the over the door storage rack. Purses and totes are on hooks on the other closet door. If your closet isn’t organized you have way too much so just pear down it’s that simple. Sort/storage/giveaway! It’s that simple.